I did appreciate Terry’s biography of Armstrong, Pops. He’s a true polymath (see our interview), and always considers jazz as part of American popular music. Those dedicated to jazz are often over-informed by insider knowledge, and it is refreshing to remember there’s a whole wide world out there. Even when I disagree with Terry it is grist for the mill. I was pulled up short by one aspect of Satchmo at the Waldorf: the portrayal of Miles Davis. After spending an afternoon with Google and my library, what I found was interesting enough to write up briefly for DTM. In Satchmo at the Waldorf. Miles Davis appears as the “young angry black man” who thought Louis Armstrong was an Uncle Tom. The pain that one feels when Armstrong’s television performances of the middle and late sixties are recalled is so overwhelming as to constitute an enormously bitter grief, a grief made all the keener because it balances so perfectly one’s sense of shame, rage, and despair. The little, gnomish, balding, grinning black man who looked so touchingly like everyone’s black grandfather who had put in thirty years as the janitor of the local schoolhouse or like the old black poolshark who sits in the barbershop talking about how those old boys like Bill Robinson and Jelly Roll Morton could really play the game; this old man whose trumpet playing was just, no, not even a shadowy, ghostly remnant of his days of glory and whose singing had become just a kind of raspy-throated guile, gave the appearance, at last, of being nothing more than terribly old and terribly sick. One shudders to think that perhaps two generations of black Americans remember Louis Armstrong, perhaps one of the most remarkable musical geniuses America ever produced, not only as a silly Uncle Tom but as a pathetically vulnerable, weak old man. During the sixties, a time when black people most vehemently did not wish to appear weak, Armstrong seemed positively dwarfed by the patronizing white talk-show hosts on whose programs he performed, and he seemed to revel in that chilling, embarrassing spotlight. Early is writing in the late ’80s, just before Wynton Marsalis and Stanley Crouch would gain traction with an alternative narrative. People like beefs. Satchmo at the Waldorf includes Armstrong jousting with both Dizzy Gillespie and Miles Davis. Terry is very canny, and I’m certain that all the quotes are true, although it isn’t explained that some of them are from years after Louis was dead. If somebody told me that I had an hour to live, I’d spend it choking a white man. I’d do it nice and slow. Miles had a lot of facets. His support of Gil Evans and Bill Evans did the most of anybody to validate a kind of romantic or white sound in modern jazz. By 1985 all the editions of his band had had white players for years. Beefs are fun, but it is more helpful to see Afro-American jazz as a continuum. I was just listening to Miles Davis’s E.S.P. and think that part of the trumpeter’s solution to this hard new Wayne Shorter and Herbie Hancock music was to play Louis Armstrong quotes. 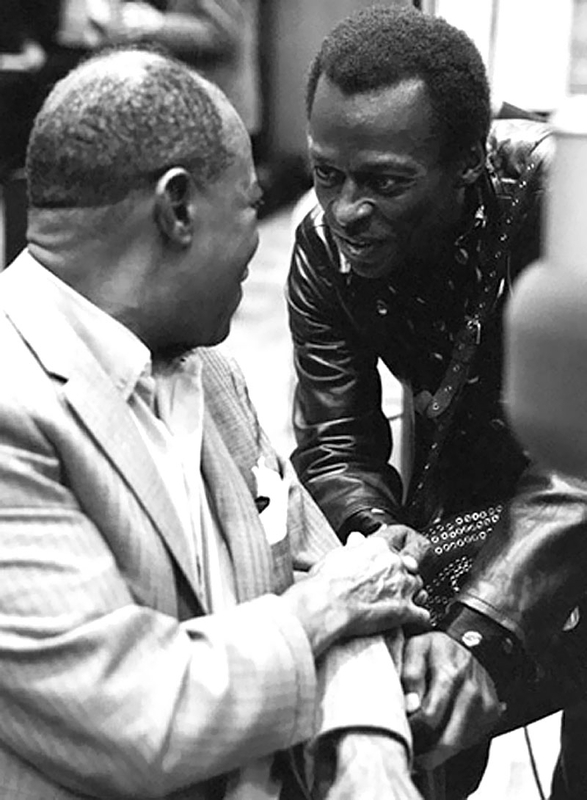 1949: In DownBeat to Pat Harris, Miles says that Louis is one of his favorite musicians. 1955: In a DownBeat blindfold test with Leonard Feather, he listened to “Ain’t Misbehavin'” with Bobby Hackett and Jack Teagarden. I believe the “statements” Miles refers to are Louis’s putdowns of modern jazz. I like Louis! Anything he does is all right. I don’t know about his statements, though, I could do without them…I’d give it five stars. Louis has been through all kinds of styles. That’s good tuba, by the way. You know you can’t play anything on a horn that Louis hasn’t played – I mean even modern. I love his approach to the trumpet; he never sounds bad. He plays on the beat – with feeling. That’s another phrase for swing. I also love the way he sings. I love Pops, I love the way he sings, the way he plays – everything he does, except when he says something against modern-jazz music. He ought to realize that he was a pioneer, too. No, he wasn’t an influence of mine, and I’ve had very little direct contact with Pops. A long time ago, I was at Bop City, and he came in and told me he liked my playing. I don’t know if he would even remember it, but I remember how good I felt to have him say it. People really dig Pops like I do myself. He does a good job overseas with his personality. But they ought to send him down South for goodwill. They need goodwill worse in Georgia and Alabama and Mississippi than they do in Europe. Hyland Harris also sent me two candids, and you can see the respect Miles has on his face when greeting Pops. I loved the way Louis played trumpet, man, but I hated the way he had to grin in order to get over with some tired white folks. Man, I just hated when I saw him doing that, because Louis was hip, had a consciousness about black people, and was a real nice man. But the only image people have of him is that grinning image off TV. This last quote is close to what Early worries about in Tuxedo Junction. In drama, clear antagonists are required. Terry has to make a story go. That should be fine, except that in Waldorf, fast-talking manager Joe Glaser is almost more interesting than doddering old Armstrong, and Miles Davis becomes a cartoon version of black nationalism. To his credit, the portrayal of the Armstrong/Davis divide is much more nuanced in Terry’s book Pops than in the play. 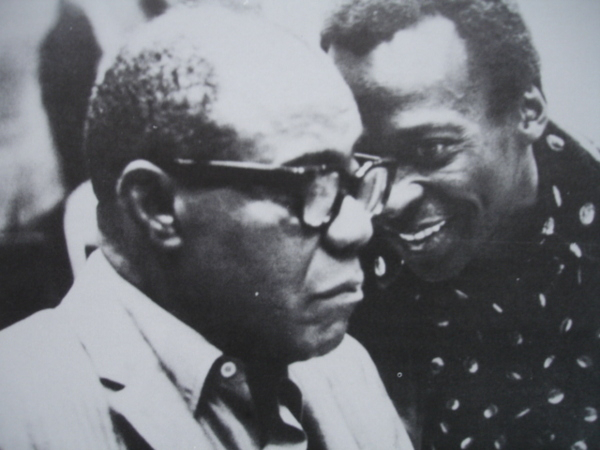 It’s just good to remember how much Miles Davis must have loved Louis Armstrong. When Miles told Haley that Louis wasn’t an influence, that just wasn’t true. Trumpet playing aside, the whole concept of playing white show tunes in an improvisatory and black music context – i.e., the bulk of Miles Davis’s recordings from the studio in the 50’s and live in the 60’s – comes straight from Louis Armstrong.